AMERICA is facing its biggest threat. Two beautiful and dangerous women, who will do anything to achieve their goals. 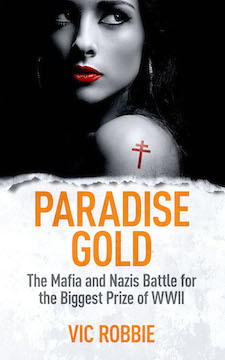 Ruthless Nazis battling Mafia assassins. And German U-boats threatening to devastate New York and other American cities on the Eastern Seaboard. The second book of this riveting World War II series takes you on a rollercoaster ride from London to the Caribbean to Manhattan. Reluctant spy Ben Peters has to pull out all the stops as the Mafia and Nazis battle for French gold. In 1941, Martinique is vital to the outcome of the Second World War. France’s gold reserves are held in the vaults of Fort Desaix, and France’s Vichy Government and its Nazi masters want the gold repatriated to fund their war. Although President Franklin D Roosevelt considers sending in troops, America has no wish to get involved in the ‘war in Europe’. But behind the scenes, factions in the US government enlist the Mafia’s assistance to rescue the gold and British Intelligence persuades Peters to act as a ‘neutral observer’ on the island. Germany’s U-boats are dominating the Atlantic, and if they get the gold Britain and ultimately America will be doomed. In this climate of danger and double-cross, Peters cannot trust anyone. And when he discovers the Nazis’ horrifying plans to wreak havoc on the United States he faces a battle against the odds to save thousands of lives.